The American Leadership Forum, celebrating more than 35 years of Fellows Programs, is proud to have published a book about the collective experience of ALF Senior Fellows across the country. 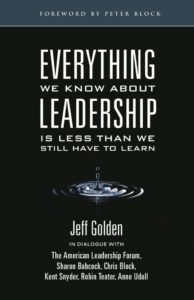 Everything We Know About Leadership harnesses the wisdom of 4,500 Senior Fellows into a slim volume of the stories and values that make up the ALF experience. Listen to opening remarks from ALF Founder, Joseph Jaworski and comments from others about the book.